Winnipeg is home to one of the fastest-growing sports out there and it’s been almost a year since I started making a documentary about it. With qualities that make it unlike any other, it’s easy to see why roller derby is gaining such a large fanbase. I’ve attended Winnipeg Roller Derby League (WRDL) games for a few years now and instantly fell in love with the sport. “Together We Roll” is a short documentary (around 10 minutes) covering a number of topics related to derby and what makes it different than other sports. These include how derby is played, its all-inclusive nature, and the challenges players face. For a breakdown of how the game is played, it’s contact sport with two teams of five members skating in the same direction around the track. A designated player, known as the “jammer,” scores points by passing members of the opposing team. Other teammates, known as “blockers,” aim to assist their jammer, while making it more difficult for the opposing team’s jammer. The Winnipeg Roller Derby League is expanding to include newer blood. Youth aged 10- to 17-years-old are now in a league of their own for the upcoming season. Saturday at The Forks, a demo skate was held to create buzz for the 22 players who have been training since January. Various sizes and athletic abilities of the participants have made up the new junior league, which includes only two boys. Coach Kim “Ella Hitzgerald” says of the players were apprehensive at first, but their self confidence has greatly improved. The juniors picked their own team names, “Blackeye Bruisers” and “Deadly Reds,” and are ready to rumble during their first bout on May 5 at the Fort Garry Curling Club. Tickets can be purchased at BrownPaperTickets.com. The ladies of the Winnipeg Roller Derby League will lace up today ahead of releasing their summer game schedule. The league will hold a fun demo skate event from 12:30 p.m. to 1:30 p.m. at The Forks to promote the upcoming season. New this year is the addition of the Winnipeg Junior Roller Derby League for skaters aged 10 to 17. The first bout of the season is Saturday, May 5. Ticket information can be found at WinnipegRollerDerby.com. The no-nonsense ladies from the Winnipeg Roller Derby League are doing their part to contribute to the Canadian Blood Service’s supply. Besides battling on the track, WRDL teams Backseat Betties, The Corporation and Valkyries’ Wrath will compete today to see who can donate the most blood at the Winnipeg Blood Donor Clinic, 777 William Avenue. The challenge is also open to the public, so anyone wanting to roll up their own sleeves can call 1 (888) 2 DONATE (1-888-236-6283) to set up an appointment. The ladies will be raising awareness of the importance to give blood on Saturday during the 2011 Roller Derby Championship at the Winnipeg Convention Centre. Competitors will be wearing their ABO blood type on their uniforms. Tickets for the championship are still available at Ticketmaster. The match-ups begin at 7:30 p.m. The Winnipeg Roller Derby League will hold their 2011 championship on Saturday, September 24 and ChrisD.ca wants to send you to see the carnage. 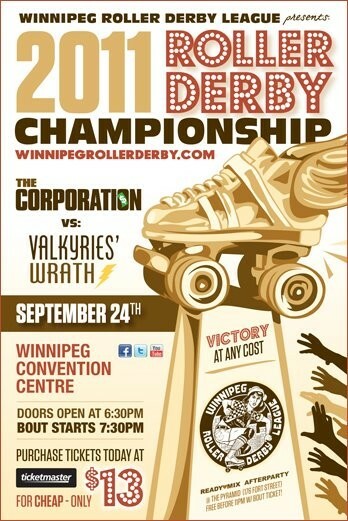 Teams “The Corporation” and “Valkyries’ Wrath” will duke it out on the floor of the Winnipeg Convention Centre. The bouts get underway at 7:30 p.m. Doors open at 6:30 p.m.
Tickets are $13 at Ticketmaster or try your chances by entering to win. Fill out the entry form below and we’ll select 15 winners at random who will pick up two tickets each. Deadline for entries is Thursday, September 15 at 5 p.m. CT. Winners will be notified the following day. Winners can pick up their tickets anytime before the event at Peach Jam Skates on the main floor of the Johnston Terminal at The Forks during normal business hours. Manitoba residents only, please. Good luck! More information is available at WinnipegRollerDerby.com. The Winnipeg Roller Derby League opened their season on Saturday to a packed house at the Winnipeg Convention Centre. About 1,600 people gathered to see ladies behaving badly on the track. “Spring Fling” featured three teams, including The Corporation, BackSeat Betties and Valkyries’ Wrath in an all-out battle. ChrisD.ca gave away tickets to the season opener and sent 20 people to the matchup. Watch for future WRDL ticket giveaways. The Winnipeg Roller Derby League is holding their season opener on Saturday, April 30 and ChrisD.ca wants to send you to see the carnage. These ladies don’t hold back on the track and won’t let anyone get in their way. Three teams will battle it out at the Winnipeg Convention Centre as part of Spring Fling beginning at 7:30 p.m. Doors open at 6:30 p.m. Fill out the entry form below and we’ll select 10 winners at random who will pick up two tickets each. Deadline for entries is Wednesday, April 27 at 11:59 p.m. CT. Winners will be notified on Thursday, April 28. Winners can pick up their tickets anytime before the event at Peach Jam Skates on the main floor of the Johnston Terminal at The Forks between 10 a.m. and 6 p.m. on Thursday, 10 a.m. to 9 p.m. on Friday and 10 a.m. to 6 p.m. on Saturday. Manitoba residents only, please. Good luck!